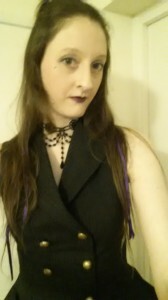 I went out to Wendyhouse last night for the first time in about two years. The least appalling selfie which I took before going out is on the right, but it is physically quite difficult to press the right button on my phone-camera without dropping it or causing massive camera-shake, so I struggled to get one which showed what I was wearing without also capturing an annoyed and frustrated expression. One made a special point of saying that he had liked my dancing. Always nice to hear. Another told me that my outfit looked very expensive. In Yorkshire, this sort of comment can sometimes be code for "Well, you're a bit up yourself, aren't you? ", so I quickly denied anything of the sort, but it turned out that he meant it in a very genuine "You look like a million dollars" sort of way. And a third literally walked up to me, tapped me on the arm and said "Excuse me, would you like to dance? ", which I didn't think was a phrase familiar to the Youth of Today. Furthermore, when I said that actually I had been just about to go and sit down for a while because my feet were killing me (which was true), he accepted that perfectly happily, pointed out the area of the dancefloor where I could find him if I changed my mind later, and walked away. Which shouldn't be a rare and noteworthy experience for a single woman in a nightclub, but sadly it very much is. If only all chaps would follow the same approach. That mouldy-looking grey dust stuff on the floor all around them is the remains of whatever substance used once to fill the platform soles - some kind of synthetic foam-type material, I assume. 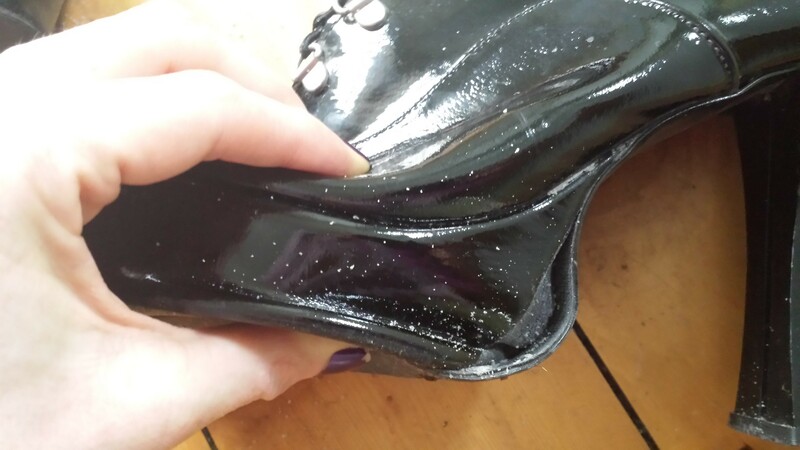 I see how that would be a good filling for platform soles in the short term, as it would keep the boots relatively light compared to (say) wood, resin or plastic, in turn making them nicer to wear and move around in. But it has obviously degenerated with age since I bought the boots ten years ago, and last night was the night when it finally gave up the ghost, collapsed in on itself and began pouring out of the sides of the soles. This means I spent half the night with the balls of my feet supported by the sorry remnants of an empty shell, rather than a nice solid platform. But because the heels remained solid and steadfast throughout, my feet were tipped forward much more than they were supposed to be, so it's no wonder that my toes hurt and the heels seemed so much higher than I'm used to than I was expecting. 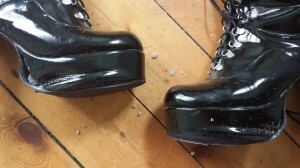 Today, the backs of my calves are aching rather for the same reason, and sadly the boots are clearly a total write-off. Yeah, Leeds has a pretty good alternative scene, and not just Goth stuff either - metal, rockabilly, and retro stuff are all catered for. The Sisters of Mercy came from here, and there are lots of Goth bands based in the city now as well - some of which my mates are in, like Zeitgeist Zero and Berlin Black! Poor boots. :-( Mind you, I would feel quite a lot more sympathy for them if they hadn't hurt me so much while they were dying. 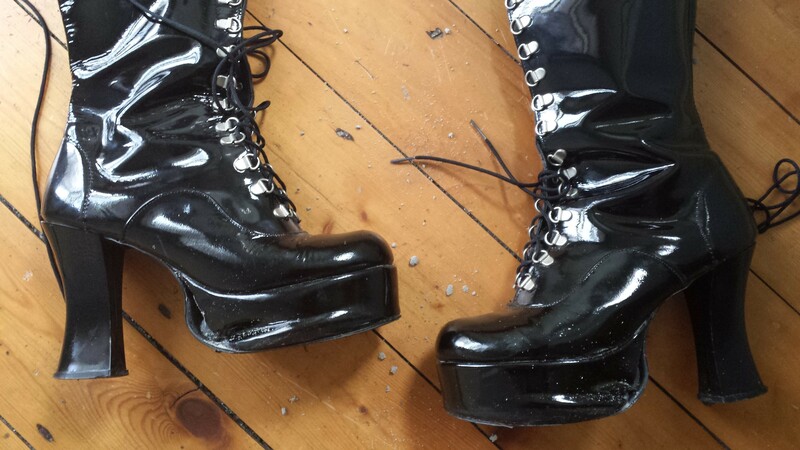 They wouldn't be goth boots if they didn't cause Angst and Drama before flouncing out forever. You know, you look younger in the selfie from last night than you do in the icon! Ha! That is probably just because of the afore-mentioned camera shake, creating a sort of soft-focus effect. Did Strange Beardy Dancefloor Bloke pass on any compliments to you, or did he only get as far as staring at you? Heh, no - he was the dishonourable exception to last night's general rule of Impressively Gentlemanly Behaviour. He just got in my way a lot and generally annoyed me. Sounds like a good night and your outfit looks great! And yeah, it's extremely hard to get a decent photo of more than just your face with a phone! I suppose that's why most people end up taking mirror shots! Shame about the boots, although I guess ten years isn't too bad (depending on how many times you've actually worn them). Sadly I don't have a full-length mirror, plus I only had a minute or two before the taxi arrived, so couldn't mess about too much - just had to snap and go, really! Well, there is staring, and there is standing right in someone's personal space while they are trying to dance and leering at them, which is more what Strange Beardy Dancefloor Bloke was doing! But yes, last night did remind me that it's perfectly possible for men to approach women to whom they are attracted in a way which leaves the woman feeling flattered and (more importantly) still perfectly safe, even if she isn't interested in return. If you're worried that you might not have that skill down as well as you'd like, the best approach is probably to practise it on a few women to whom you aren't actually attracted, in which circumstances the stakes will be low and you won't feel too anxious about coming across badly (and hence, of course, will almost certainly come across perfectly nicely). Compliments on people's outfits in particular (or anything equivalent, such as a talk they've just given) are unlikely to get you into too much trouble, and might lead to a nice friendship. It sounds like you had a nice night out. And I agree that some of the things you mentioned shouldn't have to be things that are odd but such is life. If only more people could learn that polite pleasant compliments are much nicer much more welcome than forceful entitlement. Yep, absolutely. The world would definitely be a happier place. Rock of Ages is definitely a Good Thing, although it looks like the next one will be this coming Saturday. I'll be in Bradford for the day that day, and not sure when I'll get back, so prob best not to try to squeeze in clubbing as well that night. Meanwhile, weekends that look good for Roman board gaming in my calendar at the moment include Feb 8-9, 15-16 and 22-23. Either the Saturday or the Sunday is fine by me in any of those cases. I'm away over this month Rock of Ages - and I'm away over next months as well (assuming it will be the 22nd of Feb which seems to be the pattern). Bah! Oh well - I'm sure Rock of Ages will still be there in March. How about Sunday the 9th of Feb for Roman themed games? I'll ask Ed if he thinks pub or house for Sparticus. But it's close enough to a plan for me. I don't think any Doc Martens could quite replace these - it's quite a different bootly register! But I might well be interested all the same. I have some purple Docs already which I sometimes wear to work when it is snowing, but they are very beaten-up because I also use them for gardening. It might be nice to have two distinct pairs - one suitable for work, one relegated to the gardening. Could you bring them in to campus so they're here for me to try on when we next meet for lunch? Sure! I was going to re-eBay them, but happy to give you first preference! They are definitely too nice to garden in. What size DMs do you take? These are a 41. That should be more or less right. I'm a size 7 in UK terms. I'll check what size my existing ones are, but unless you hear back from me you can assume they'll be fine.